Event Hubs Capture is the easiest way to automatically deliver streamed data in Event Hubs to an Azure Blob storage or Azure Data Lake store. You can subsequently process and deliver the data to any other storage destinations of your choice, such as SQL Data Warehouse or Cosmos DB. In this tutorial, you learn how you to capture data from your event hub into a SQL data warehouse by using an Azure function triggered by an event grid. 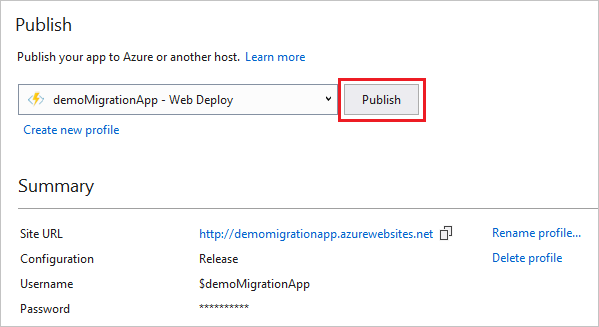 First, you create an event hub with the Capture feature enabled and set an Azure blob storage as the destination. Data generated by WindTurbineGenerator is streamed into the event hub and is automatically captured into Azure Storage as Avro files. 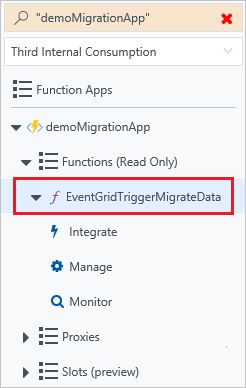 Next, you create an Azure Event Grid subscription with the Event Hubs namespace as its source and the Azure Function endpoint as its destination. Whenever a new Avro file is delivered to the Azure Storage blob by the Event Hubs Capture feature, Event Grid notifies the Azure Function with the blob URI. The Function then migrates data from the blob to a SQL data warehouse. Stream sample data into Event Hub. 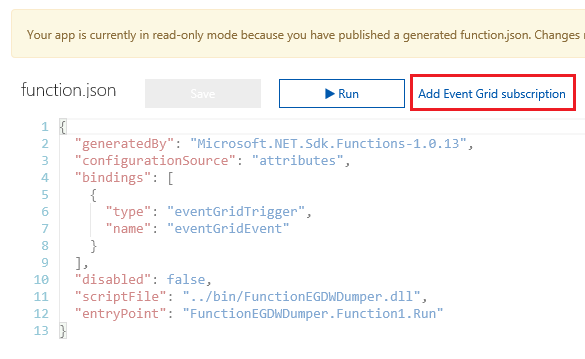 FunctionDWDumper – An Azure Function that receives an Event Grid notification when an Avro file is captured to the Azure Storage blob. It receives the blob’s URI path, reads its contents, and pushes this data to a SQL Data Warehouse. These scripts take some time to create all the Azure artifacts. Wait until the script completes before proceeding further. If the deployment fails for some reason, delete the resource group, fix the reported issue, and rerun the command. Create a table in your SQL data warehouse by running the CreateDataWarehouseTable.sql script using Visual Studio, SQL Server Management Studio, or the Query Editor in the portal. Open the solution EventHubsCaptureEventGridDemo.sln in Visual Studio 2017 (15.3.2 or greater). 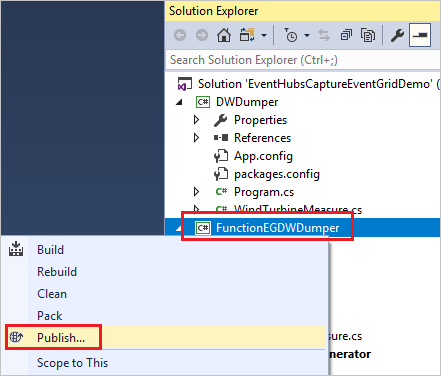 In Solution Explorer, right-click FunctionEGDWDumper, and select Publish. 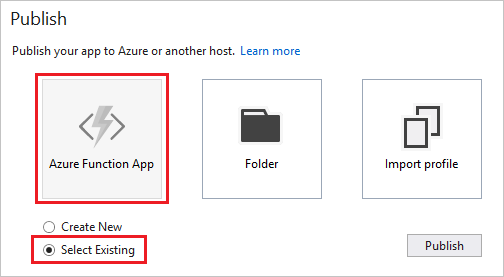 Select Azure Function App and Select Existing. Select Publish. 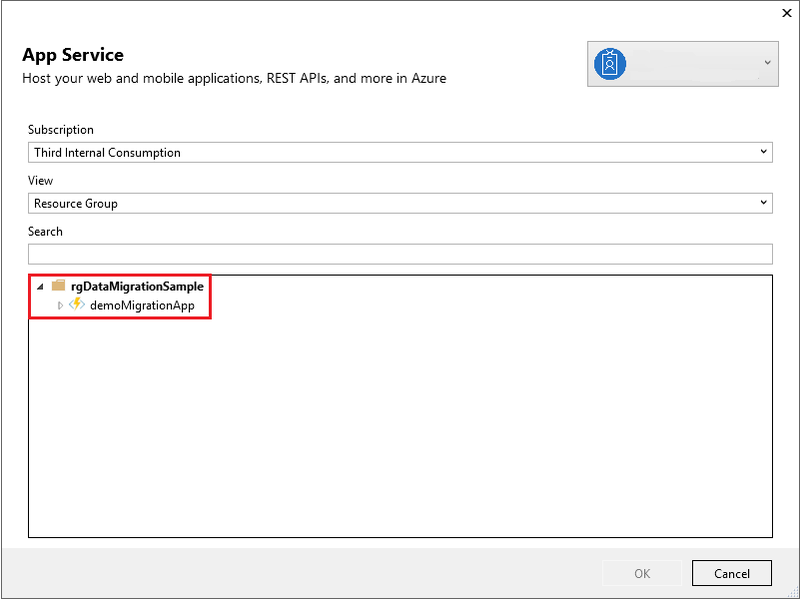 Select the function app that you deployed through the template. Select OK. When Visual Studio has configured the profile, select Publish. After publishing the function, you are ready to subscribe to the capture event from Event Hubs! Go to the Azure portal. Select your resource group and function app. Select Add Event Grid subscription. Give the event grid subscription a name. 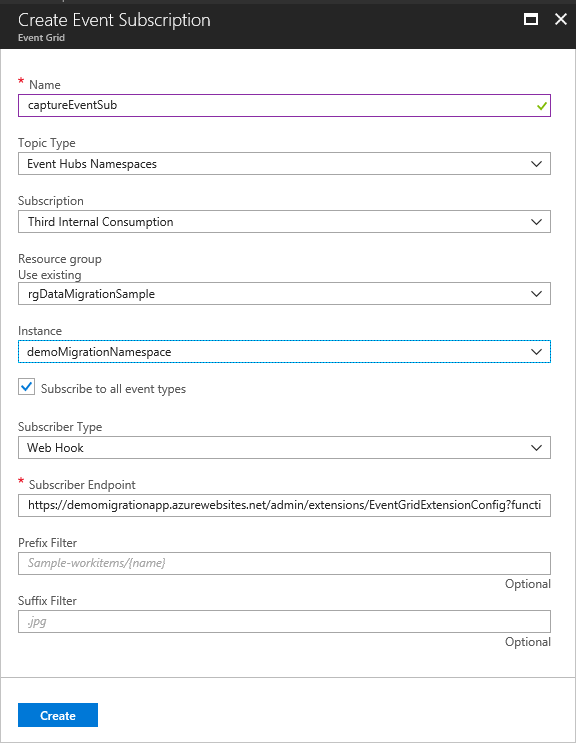 Use Event Hubs Namespaces as the event type. Provide values to select your instance of the Event Hubs namespace. Leave the subscriber endpoint as the provided value. Select Create. You have now set up your Event Hub, SQL data warehouse, Azure Function App, and Event Grid subscription. You can run WindTurbineDataGenerator.exe to generate data streams to the Event Hub after updating connection string and name of your event hub in the source code. In the portal, select your event hub namespace. 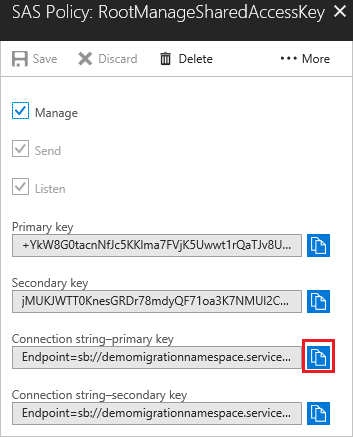 Select Connection Strings. Go back to your Visual Studio project. In the WindTurbineDataGenerator project, open program.cs. Update values for EventHubConnectionString and EventHubName with connection string and name of your event hub. Build the solution, then run the WindTurbineGenerator.exe application. After a couple of minutes, query the table in your SQL data warehouse. 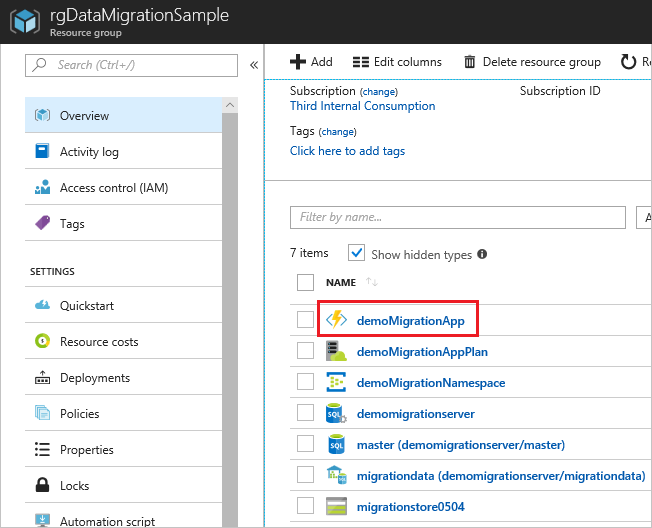 You observe that the data generated by WindTurbineDataGenerator has been streamed to your Event Hub, captured into an Azure Storage container, and then migrated into the SQL Data Warehouse table by Azure Function. You can use powerful data visualization tools with your data warehouse to achieve actionable insights.